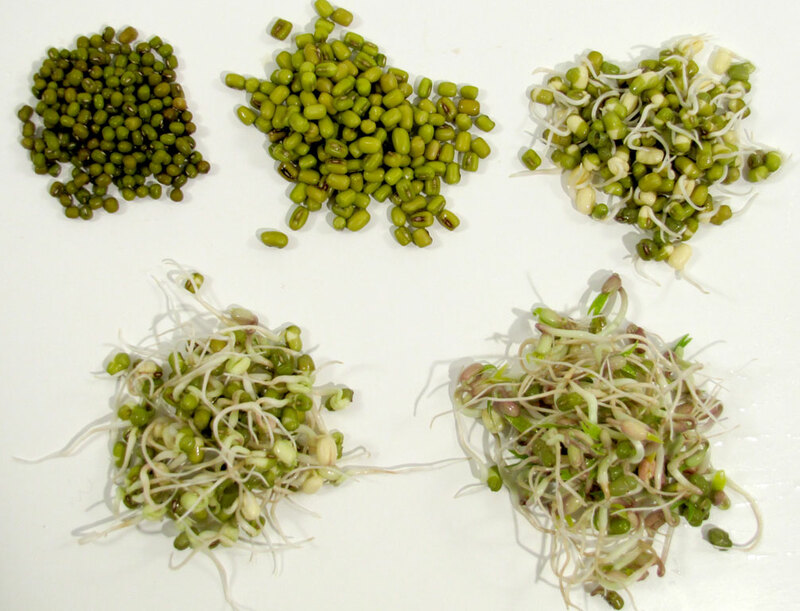 Video recipe - When beans sprouts it starts a lot og biological processes, that turns the hard and reather healthy beans into even healthier vegetables. Bean sprouts are good in salads and as a filler in soups or asian food. The sprouts you buy in the supermarket are often a bit bitter and has a taste of dirt. If you grow your own you can eat them before the taste turns dirt-like and bitter. They actually taste a lot more like fresh green peas. Let the beans soak in water for 12 hours. Put them in a dark and cool place until they have swollen to the double size. Drain the water and rinse them once with clean water. Drain all the water and place them once more in a cool and dark place until they are big enough to eat. Typically after 3-4 days. While they are sprouting you must rinse them ever 12 hours with clean cold water. When they have the size and taste you prefer, rinse them one last time and put them in the fridge until you are ready to eat them. Eat them when you think they taste the best. Personally I prefer them after 2-3 days. You can basically use all kind of seeds from pulses. Beans, chickpeas etc. The beansprouts you typically buy at a store are made from the green bean called Mung. They make good sprouts and are easy to handle. When you make your own sprouts they are typically thinner and more curly than the ones you can buy. That is not because you do something wrong. If you want them straight and thick they need to sprout under pressure. Ie between two pieces of canvas bag that are under pressure.